It's not easy to get close to a bald eagle, since they're usually soaring freely above. But when one bald eagle was discovered last week, huddled on the ground, weak and starving, rescuers easily snatched him up and carried him in their arms. 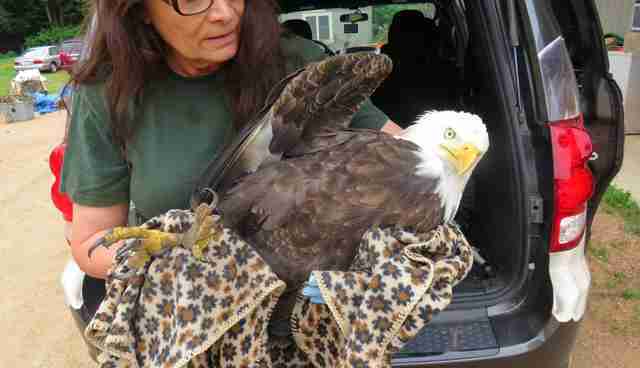 The weak bald eagle let rescuers carry him to get help. Raptor Education Group, Inc. 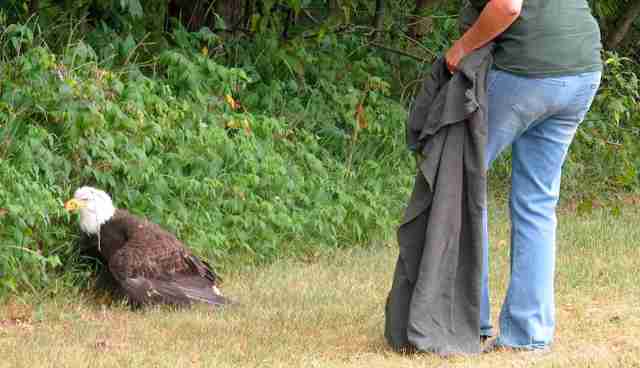 Thanks to the landowners who spotted the bald eagle and alerted Raptor Education Group, Inc. (REGI) in Antigo, Wisconsin, the bald eagle was plucked from the brink of death. He was severely underweight and dehydrated. Raptor Education Group, Inc. The bird was brought to REGI, where he was given blood tests and weighed. At just over 5 pounds, he was severely underweight. Rescuers brought him to a rehabilitation center. Raptor Education Group, Inc. The reason he was in such terrible shape? Chronic lead poisoning. Bullets, fishing sinkers, paint chips and some pesticides are just a few of the hazards littering our country and poisoning birds, including our country's iconic bald eagle. He was weighed on a scale. Raptor Education Group, Inc. 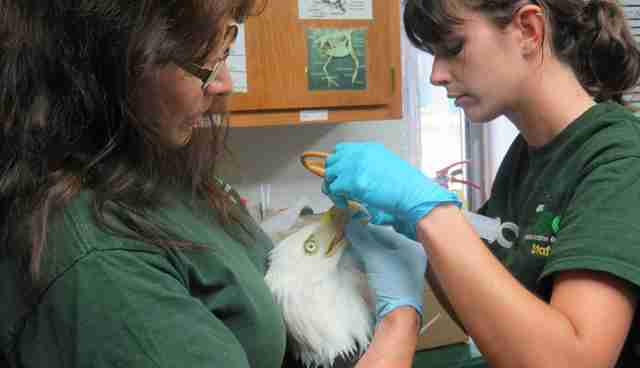 The wildlife rehabilitators at REGI are now giving their new patient expensive injections to cleanse the trace lead from the bald eagle's blood. 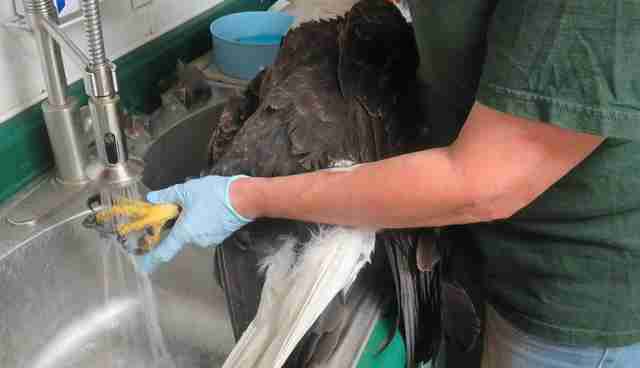 Rescuers washed the eagle's feet, where poisons and pesticides can be absorbed. Raptor Education Group, Inc.
"It is a very difficult process for the birds and very expensive for us," Marge Gibson, of REGI, told The Dodo. "We now have the medication compounded for us at a pharmacy so the cost is less than in the past. 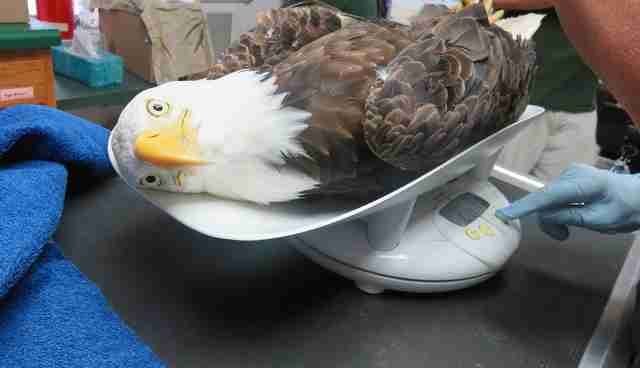 It was not unusual for pharmacy cost on a single lead poisoned eagle to be $1,500." 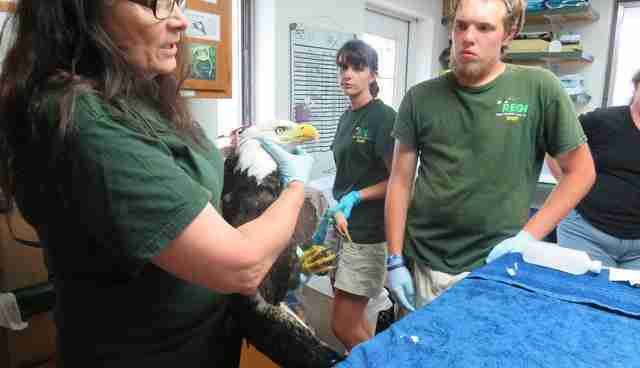 The bald eagle is undergoing a treatment for lead poisoning. 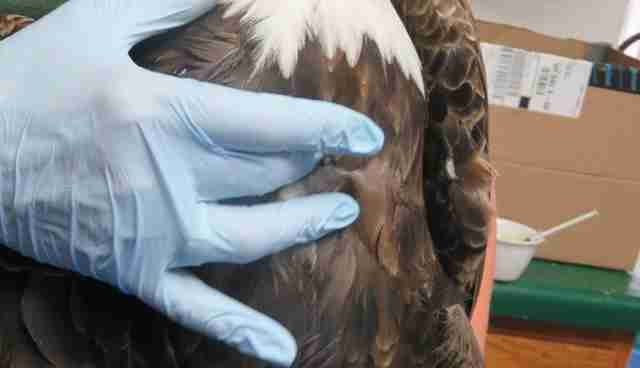 Raptor Education Group, Inc.
Lead poisoning leads to starvation in birds like the bald eagle because lead shuts down the digestive system and the bird is unable to eat or digest food. Slowly, he's regaining his strength. Raptor Education Group, Inc.
"Lead poisoning is a huge problem," Gibson said. "People need to know about it." Luckily, this little guy got the help he needed just in time. Click here to learn how you can support the wild patients at Raptor Education Group, Inc.